We crossed the border from Paraguay into Brazil in the town Foz do Iguacu, which is about 30 km north of the Iguazu Falls. We didn’t stay in the city instead we rode to a campsite not far from the falls. On our around the world tour we have seen quite a few waterfalls, but honestly most of them have been “tourist traps” and not very exciting. However, we thought we must pay a visit to the famous Iguazu Falls. There are two options to see the Iguazu Falls, the Brazilian side or the Argentinean side, and we went for the Brazilian side. Iguazu Falls is the largest waterfalls system in the world, featuring an impressing 275 separate cascades of varying heights and widths. On the Brazilian side they had built trails that wind their way around the falls and brings you straight into the heart of it all, and the falls are absolutely massive and truly breathtaking. One very wet and noisy experience was the full-frontal views of the Devil’s Throat (Garganta del Diablo), where it was a narrow footbridge that took us out just in front of the huge fall. I really enjoy photographing tourists that photographing each other. The photo below came out rather good and won a photo competition in Sweden. The coatis (raccoon family) are constant presence on the tracks of the Iguazu Falls and love the bins. We were lucky with the weather the day we were visiting the falls, we even had some sunny spells, which we hadn’t been spoiled with lately. Having said that, during the night after we got some really heavy rain, which totally flooded our tent. In the morning we had to move the tent into a common area, which gave us shelter and allowed us to dry up. On the way to Paraty, about 220 km west of Rio de Janeiro we took a small detour to a beach. On the way back to the main road Anders and I got, let say, different opinions about something totally irrelevant that we now can’t even remember what it was. Anyway, it resulted in that we ended up riding on different roads the way back to the main road. As I have no sense of directions what so ever, of course, I ended up on a small dirt road, which was rather challenging, while Anders rode back the same way we had come. I was standing there waiting for over two hours before anyone stopped, and the person who stopped couldn’t help me. However, he told me that some road workers were coming my way in about half an hour, that would have an air compressor in their vehicle. I waited again, exactly 53 f..king minutes, before the vehicle came and within 10 minutes the nice guys had inflated my tyre. I rode about 5 km and then it was flat again, bugger… However, this time it was actually in a tiny village. I stopped a women and pointed at my flat tyre and do you know what, she could speak English, lucky me. She told me that it was a small garage only 500 meters away. I thanked her probably ten times before I started to ride/walk my bike there… the positive with a puncture is that I for once actually can reach the ground properly with both my feet, without tiptoeing. Anyway I was ‘albatrossing’ my way to the garage. I guess the people that overtook me had a laugh. When I, at last, exhausted, sweaty and with a very red face arrived at the garage the guys were willing to help me out and luckily they had Wi-Fi too. At last, I could send Anders a message. He had ridden the whole way to Paraty, so he had to turn around and come back the about 100 km… and it served him right, in his face. 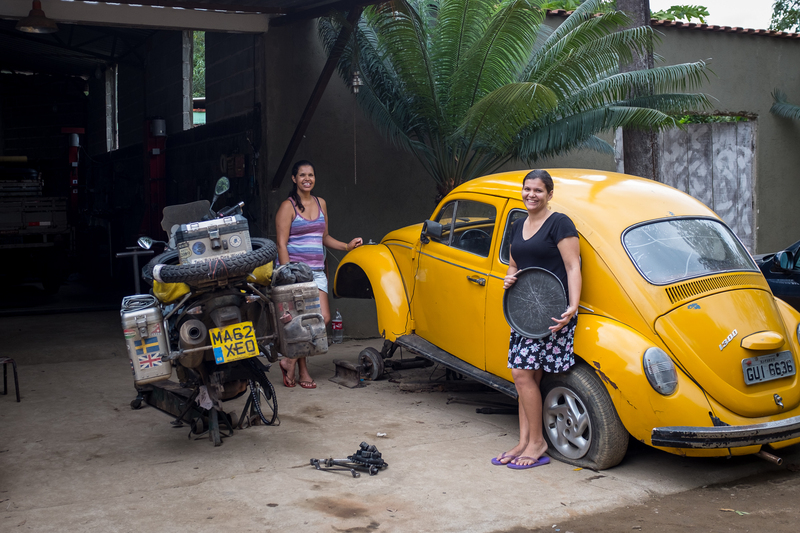 We saw lots of these cute Wolksvagen Beetles in Brazil.. there was even a special garage for them. Before we left the hostel they asked if we wanted to write something on their wall and who can resist to write on a wall so of course we did that. What a feeling it was to ride into Rio De Janerio. Rio De Janeriro, just the sound of it makes me feel good. Oh well it actually started with a flat tyre. It happened outside a shopping centre and just 20 meters from Dominos pizza so, at least, we didn’t need to sort it our hungry. It took a fair amount or time so we were not sorted until midnight. 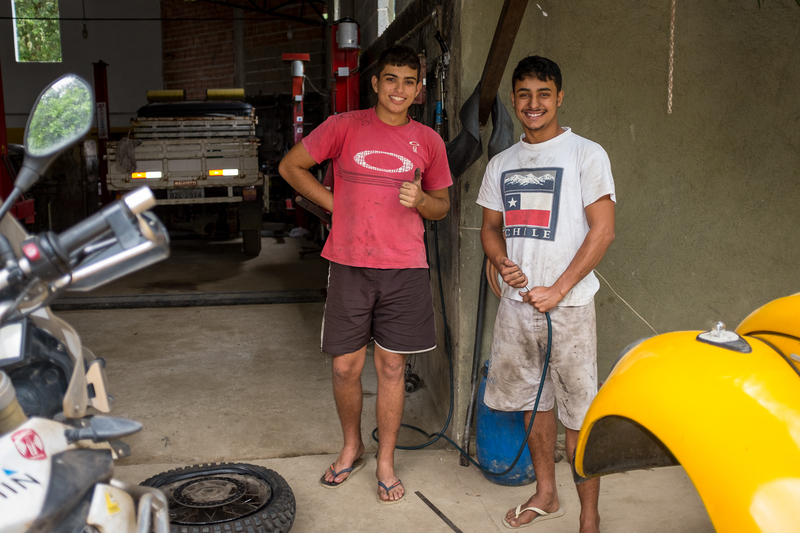 We were tired but also very excited to be in RIO DE JANIRO… YEAH!!!! We photographed, Christ the Redeemer which is an Art Deco statue of Jesus Christ in Rio de Janeiro. It is created by the French sculptor Paul Landowski. We were rather lucky to get the photo as when we came up to take the photo it was hiding behind clouds and we nearly gave up when it suddenly cleared up for a few second and we managed to take the photo below. Neither Anders or I are very keen on touristy stuff but we do like botanic gardens. Not that we know about plants and stuff, actually we don’t know anything, but we both like to stroll around for a day and look at these beautiful growing things. We were lucky to meet Aloisio in Sao Paulo and he was so kind and let us stay in his flat for a week… another of these fantastic people we met during our years on the road. Aloisio introduced us to the guys at Touratech in Sao Paulo who invited us to come with them to the BMW Motorrad Days at Campos do Jordao. We had a couple of great and fun days meeting lots of other bikers. It rained a lot during the BMW event. After spending a week in in Sao Paulo and having a fantastic time with Aloisio and the Touratech guys at the BMW Motorrad Days at Campos do Jordao, it was time for us to say goodbye and ride to the Pantanal. The Pantanal is the world’s largest tropical wetland area, located mainly in western Brazil’s Mato Grosso do Sul state, with an area estimated between 140,000 and 195,000 square kilometres. The Pantanal is said to be a better place to watch wildlife than the Amazon. The dense vegetation of the Amazon makes it difficult to find and see the animals, unlike the open swamplands of the Pantanal. 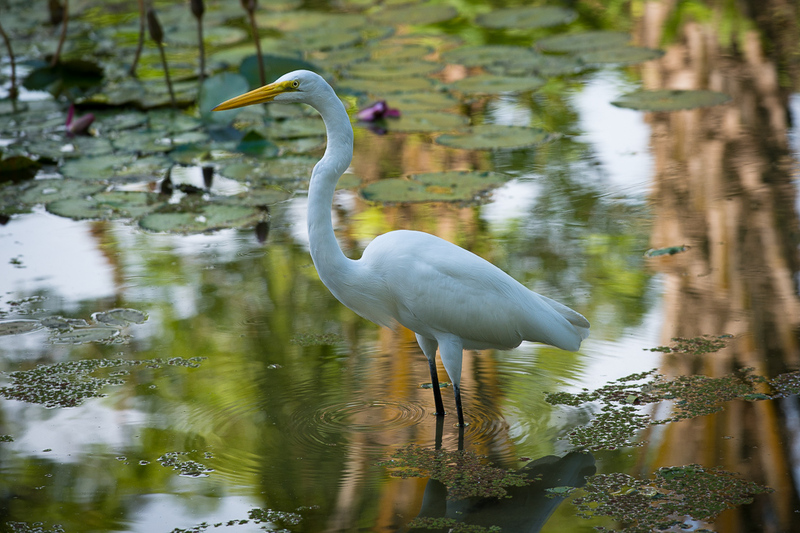 The swamps in the Pantanal are well known for its wildlife and home to hundreds of species of birds, along with caimans, jaguars, capybaras, etc. Roughly 80% of the Pantanal are flooded during the rainy seasons, while the winter dry season creates plentiful lagoons. We were there during the dry season, which is the best time to watch birds and the greatest chance to see the mysterious Pantanal jaguar. On the fantastic ride through these wetlands, on nice compacted red clay roads, we saw loads of birds and caimans, but unfortunately no jaguar. Both Anders and I agreed that this is definitely a place that we would like to come back to and spend some more time photographing animals. Yellow-billed cardinal (Paroaria capitata) on my Touratech helmet. Maybe think twice before swimming in Pantanal. After Brazil we rode the whole way back to Uruguay to catch the Cargo ship that would take us back to Europe… took us five loooong weeks. Lovely pictures of the wildlife in the Pantanal. You are giving me a really good education about countries that I know little about. Pantanal was a fantastic place with lots of wildlife, can really recommend… think it is even better to cycle there as the animal do not like the sound of a motorbike.